WAIST HIGH: Happy 25th Birthday The Luxury Gap. Happy 25th Birthday The Luxury Gap. 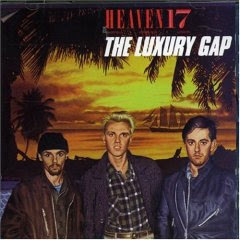 The second album by Heaven 17, The Luxury Gap was the band's biggest selling, reaching #4 in the UK charts. Unlike their debut album Penthouse and Pavement, the singles from The Luxury Gap charted well, especially "Temptation," which reached #2, "Come Live With Me," which went to #5, "Crushed By The Wheels of Industry," hit #17, and "Let Me Go," reached #41. The 2006 remastered and re-released The Luxury Gap features the magnificent extended version of "Let Me Go," a Waist High favorite.